Screaming Hand exhibit at the MAH. Santa Cruz surf and skate lifestyle has been an internationally recognised treasure, and when combined with our local art culture, this city has generated surf and skate artwork unlike anywhere else. One of the most prestigious artists specializing in this genre who has inspired surf and skate art for the past five decades is local resident Jim Phillips. Work and words by Jim Phillips. Out of his thousands of graphic designs, one has stood out from the rest and stood the test of time. This year, Phillips’ renowned “Screaming Hand” image turns 30. In celebration of this popular design, the Santa Cruz Museum of Art and History is currently exhibiting original art by Phillips, along with work by 200 other contemporary artists who have been creatively inspired by his iconic image. 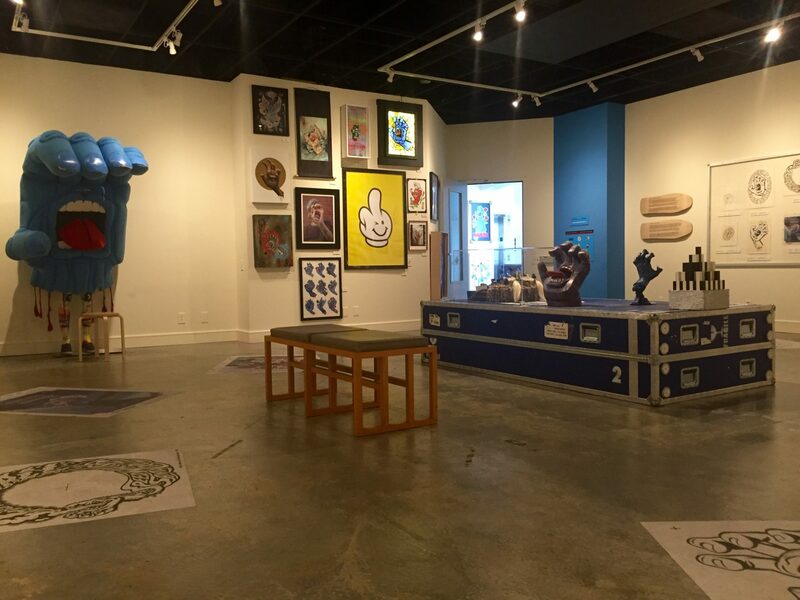 The exhibit features artwork Jim Phillips and 200 other contemporary artists from around the world. Phillips was born in San Jose in 1944, has been in Santa Cruz for most of his life, and is best known for his surf and skateboard art. When many of his high school friends were outside skateboarding, Phillips was inside drawing images of it. His career was launched when his surf car cartoon “Woody” won Surfer Quarterly magazine’s 1961 contest, and was published in their 1962 spring issue. His surf art was featured in many surfing publications during the 1960s, at which time he attended Oakland’s California College of Arts and Crafts. 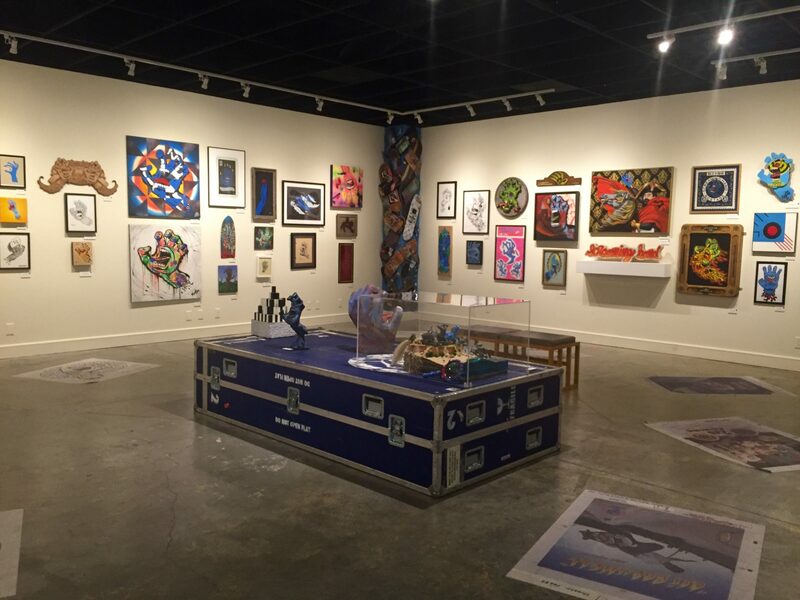 The mixed media art is inspired by Phillips and skate culture. In the 1970s and 1980s, Phillips was Art Director for Santa Cruz Skateboards and NHS, Inc., a local skateboard manufacturer and distributor. As director, he created thousands of skateboard decks, t-shirts, stickers, product illustrations, advertisements and art designs. Phillips now designs special edition decks as well as other skateboard, snowboard, and surfboard products in Santa Cruz and abroad. The show is displayed in the Art Forum on the 3rd floor of the MAH. 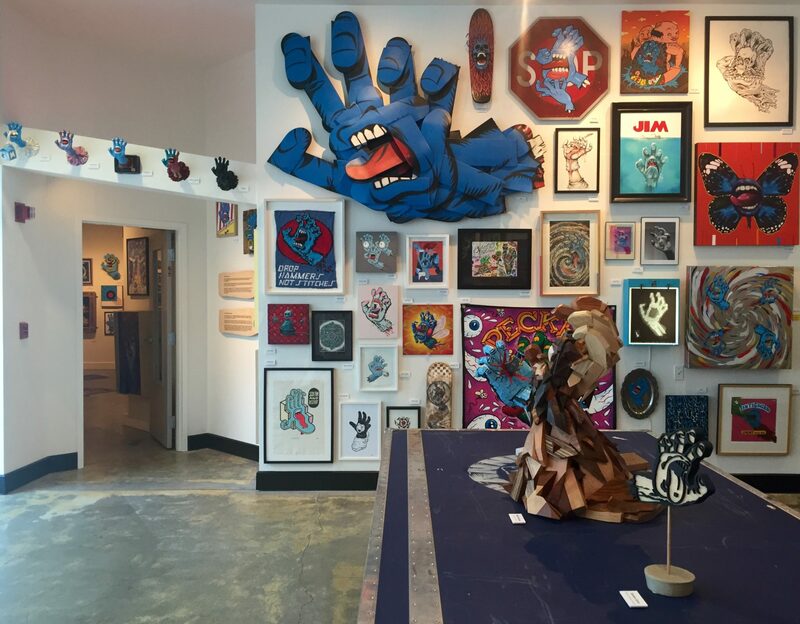 The exhibition opened this August and is located on the 3rd floor in the MAH’s Art Forum, where two rooms present work and words by Phillips, as well as mixed media interpretations of the Screaming Hand and other artwork by creatives worldwide. 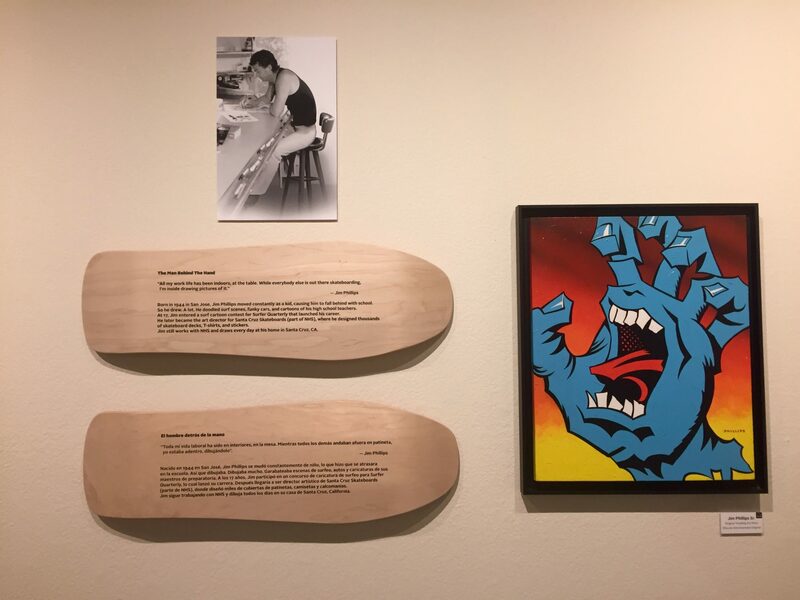 Although much of his earlier work was lost, the exhibition reflects the power his surviving design legacy has had on influencing youth and skate culture as well as other artists around the world. A Screaming Hand mural spreads across the hallway and waterfalls down the staircase. In addition to the art across the floors and along the walls, there is a mural extending across the hallway and down the stairs, as well as a rotating installation of Screaming Hand designs by Phillips and international artists down the center of the stairwell. As part of their interactive approach, the MAH provides a table, chairs and drawing materials in one of the 3rd floor rooms, to encourage visitors to try their hand at creating a version of the hand. The MAH gift shop sells Screaming Hand collectibles. 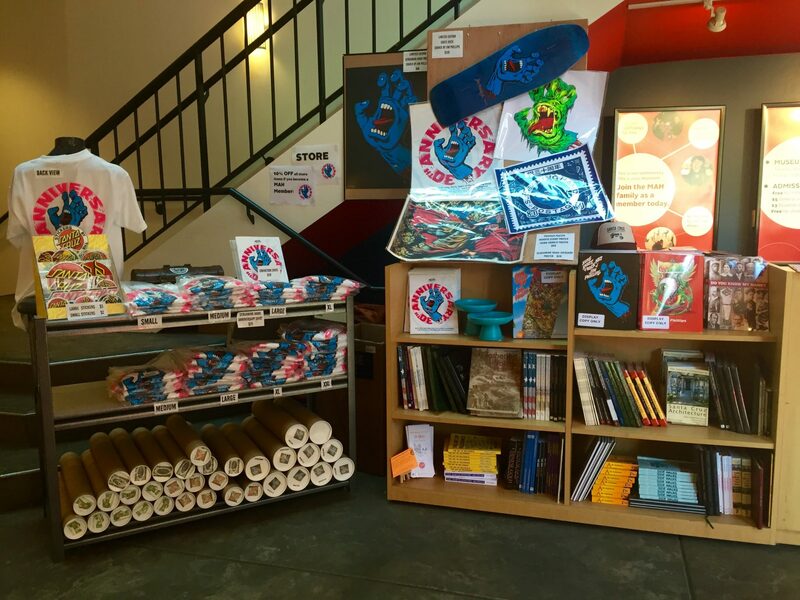 There are also books, posters, shirts, and other collectibles representing the work of Phillips and Santa Cruz culture in the museum lobby. 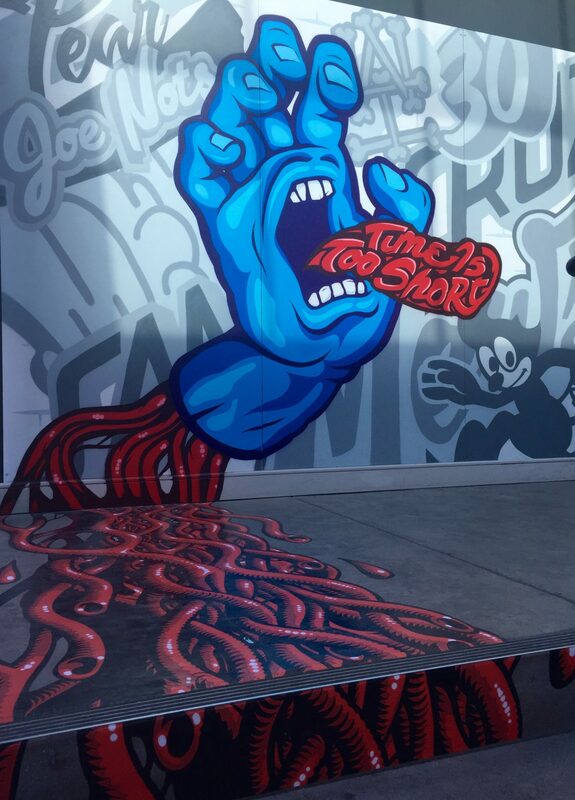 The Screaming Hand exhibition opened on August 5th, 2016, and runs through March 26th, 2017. Nicky Gaston above, Mark “Fos” Foster below. To view more work by Jim Phillips, visit his website. Stay tuned for more exhibits and events at the Santa Cruz Museum of Art and History at the Mcpherson Center. My name is Dixon from Florida (FL). I actually observed my wife has been viewing your website on my laptop and i guess she likes your piece of work, I’m also impressed and amazed to have seen your various works too, : ) You are doing a great job. I would like to receive further information about your piece of work and what inspires you. I am very much interested in the purchase of the piece (in subject field above) to surprise my wife. Kindly confirm the availability for immediate sales. I am hoping to viww the same high-grade blog posts from you later on as well.